Last night (3 Feb) the Climate Bonds Initiative, in partnership with the London Stock Exchange Group, held the inaugural Green Bond Awards to celebrate the heroes and pioneers of this new market. Justine Leigh-Bell, Standards Manager at the Climate Bonds Initiative, welcomed a bevy of bankers, investors and green bond issuers to begin the evening. Christiana Figueres joined Justine in greeting everyone to the ceremony “in a low carbon way” – as she put it herself. “I applaud the effort to raise the profile of green bonds and acknowledge leaders in the sector. This is exactly what we need as a follow up to last years UN Climate Change Conference in Paris”. “Let me be one of the first to congratulate this year’s first ever winners of the green bond awards. You are part of the real on-the-ground movement that will spur the transformation that spells success for the Paris agreement”. Nikhil Rathi, CEO of the London Stock Exchange PLC, then took to the stage to begin the Green Bond Award presentations (full list of award winners here). The full list of Awards and Recognition Certificates in each category can be found here. 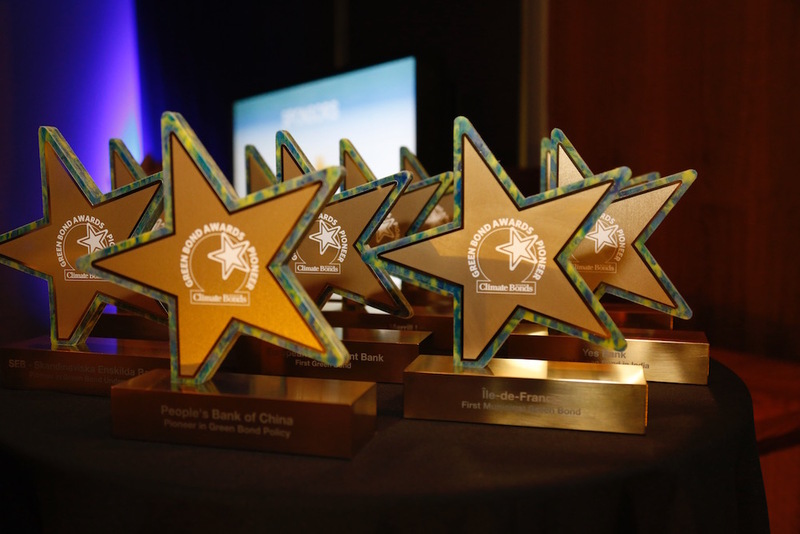 The awards recognise organisations that have demonstrated the potential of green bonds, either by being first to market, or by positive example have called investors, governments and business to action. The Inaugural Green Bond Awards were held in partnership with the London Stock Exchange Group. Foundation supporters included the PRI and ICMIF and Responsible Investor as media partner. And the event was kindly sponsored by PwC and UNEP Inquiry.